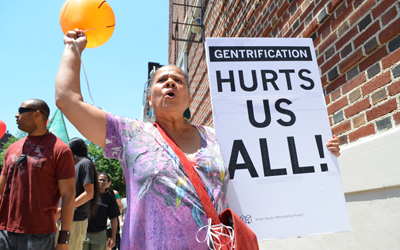 If you live in a gentrifying neighborhood like Crown Heights or Bushwick and pay less than luxury-level rent, your landlord is likely to try to drive you out by any means they think they can get away with. Your landlord will make spectacularly more money if you leave. At the very least, they can automatically charge the new tenant 20 percent more. They can raise the rent by 1/40th the cost of any renovations. If they get the rent up to $2,500, the apartment is deregulated. And if they raise the rent illegally, they probably won’t get caught, because the state doesn’t enforce the laws against rent fraud very well, and most tenants don’t know their rights. So what can you do to fight back? Be ready and willing to fight. If you want to stay, you’ll have to put in the effort to defend your home. Be prepared to spend a lot of time in Housing Court. Unite with other tenants. This should be obvious. It will be harder for the landlord to evict all of you, and it’s a lot easier to afford a lawyer if you’re splitting the tab. Work with housing and community organizations. They’ve seen these scenarios often enough to give you good advice, and they have some resources to help you organize. These include the Met Council on Housing, Tenants & Neighbors and a few dozen neighborhood groups. Document everything. Take photos of problems in the apartment. Keep records of when you send rent checks. Save emails and take notes on any phone or personal conversations you had with the landlord. If you’re black or Latino, your landlord has an extra motive to get you out: Your presence signifies a “bad neighborhood,” not the “up-and-coming” trendiness they want to sell. If you’re a young white creative or political type, you’re a pawn in the process. You’ve moved to a neighborhood you can afford that has a bit of an artistic and activist community — which establishes it as “hip” and safe for more upscale white people. Once that happens, you’re in the way too. So if you want to keep your home and community, you need to both take care of your own apartment’s situation and build relationships with the neighbors and others in the area. Steven Wishnia is the Editor of Tenant/Inquilino.